Our world has been full of marvels throughout the course of history. Way back in 26th Century BC the ancient Egyptians built the Great Pyramid of Giza, one of the most amazing structures ever built. It stood as the single tallest architectural accomplishment for a millennia and has managed to remain even to this day. We stand in awe of its greatness. In 1499 AD we had the creation of the Pieta by Michelangelo. This Renaissance sculpture that depicts the Virgin Mary holding the dead body of her son Jesus. It combines divine imagination and faith with classical ideals and has been considered one of the greatest crafts of stone ever devised. In the year 2017 the great Ebay seller Valuestampsinc founded the inspiring Harambe shaped flaming hot cheeto and successfully sold this piece of art for $100,000. 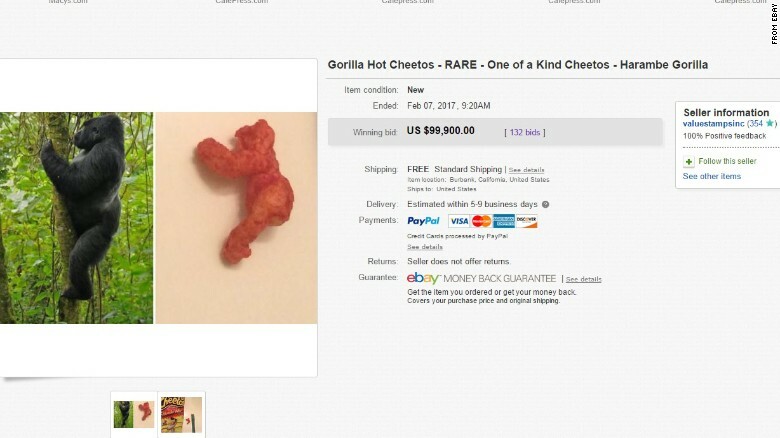 You heard that right, a seller on Ebay managed to make $100,000 off of a cheeto. It was shaped very similar to a position that Harambe held while climbing a tree in one of the photos released by the Cincinnati Zoo. There were 132 bids on the item before the auction ended. Harambe became a meme after a small child fell into his enclosure and the Cincinnati Zoo officials were forced to shoot him down in order to prevent harm to the young boy. This raised a lot of controversy as many argued that the gorilla could have been tranquilized and was obviously not trying to hurt the child but was instead helping him. The zoo argued that it was too risky. The Internet took it by storm and started hailing the gorilla as some sort of “fallen god”. The seller does appear to be a legitimate seller. They have a long history of buyer and seller feedback on Ebay that stretches back to 2008. There is little information known about the buyer, so it could be possible that it was a troll win. There are now dozens of new Harambe cheeto auctions listed on the popular selling website. These ones have significantly smaller buyouts if you are interested in getting your hands on your very own work of art.